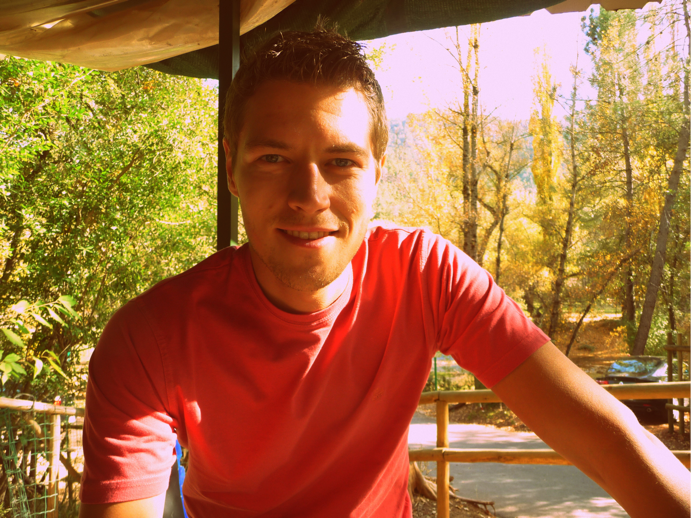 This blogpost is part of the series: ‘My Challenge: From Service Business to Product Business in 1 Year‘. You can read the full series here, or you can read this as a stand alone post. Last blogpost was about “finding a pain“. I described why it is important to start from an existing pain point in a market and solve that, instead of starting from your own “next great idea”. I also described how I did cold call many people from different niche markets to come up with a very concrete list of pain points that people would like to get rid of in exchange for $$$. But once you have identified a pain point worth solving, how do you know for sure that you will be able to market your product? 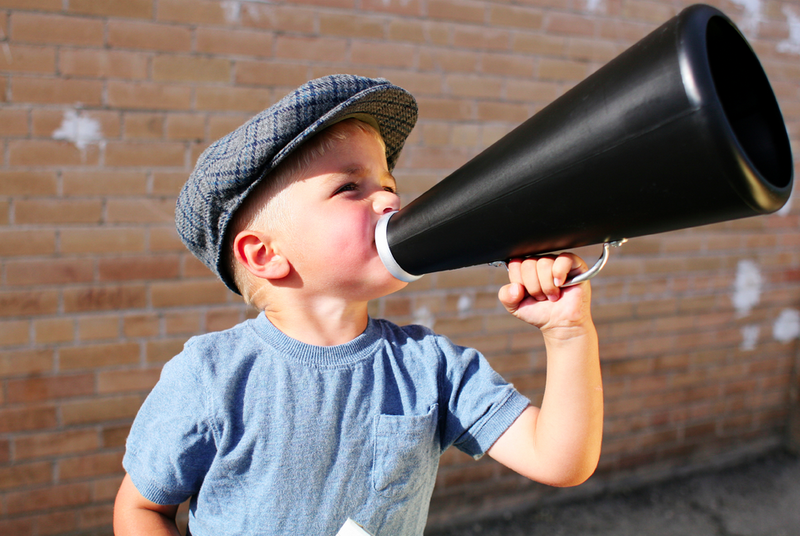 How can you reach your market? Even the best product in the world that is saving your customers hours of time per week or making them an extra thousand dollars per month is worth NOTHING if you can not reach your market in an easy and a cost effective way. So our challenge: given a pain point that a niche market wants to get rid of in return for $$$, are we able to reach that market in a cheap and easy way? As always, the key is the same: don’t invest tons of time and effort into building your product before having a proof in hand that you will succeed. That also means: succeeding in marketing your (future) product. There is a great blogpost by Rob Walling, a bootstrapper I look up to, called “Why You Should Start Marketing The Day You Start Coding“. I would change this to: “Why You Should Start Marketing Before Writing Any Single Line Of Code“. We want to measure and proof that we can reach a lot of people in our market with reasonable effort. We want some evidence that within a few days, we could easily reach about 100 very interested people. The typical way to do this is to set up a “coming soon page” where interested people can leave their email adres. This is a page announcing your product, what pain it will solve and giving people the option to leave their email adress in case they want to stay informed. Such a landing page is a wonderful thing! It allows you to invest barely nothing, but measure demand and lets you test if you can actually market your (future) product. People have to get their kids from school, answer emails, go to the fitness, cook, shop, work, pick up phones or visit their grandma. If – despite all of this – they take the time and effort to read your page and leave their email adress to a total stranger, then they are interested in your product, no? Our coming soon page as an example. “Finally” I hear you thinking. One of the niche markets we have been calling are architects. Why? They are traveling a lot between construction sites, so web and mobile technology could come in handy for them. We can easily identify, isolate and target them, so that means easy to market (e.g. there are blogs for architects, email lists of architects, LinkedIn groups for architects, …). A typical architect has a decent profit margin, on average they don’t make loss, so they have some money to invest to improve their workflow (transport business for example is much less profitable). They sell their time (per hour, or fixed price per project), so time is money for them. If we can save them a few hours per week or per month, that is worth a lot for them. So we called a lot of architects asking what pain points they have. What is irritating them on a daily basis? It turned out that the administrative duties, the time lost and the headaches related to making and sending out site reports keep them busy at night. Architects have to visit all of their construction sites on a weekly basis. They look for mistakes during construction, the status of the construction site, if we are on schedule or not, improvements since last time, and so on. Then they take pictures with their camera, they make notes on paper, they sketch on their plans. Sometimes they visit 4 sites per day. When they arrive at the office, they open MS Word (which is a pain point on its own), and start typing out all the notes (again! ), importing the related pictures from their camera via USB (!) and scanning the plans and sketches in order to import them in MS Word. Eventually, after some hours spent, they have their reports ready and can send them out. A lot of them told us literally that they would pay for a solution to get rid of this administration. The coming soon page is hosted for free on Heroku. Cost: $0. The page uses the free and open source front end framework Bootstrap. Cost: $0. Time spent on the page: between half a day and a day. Time spent on finding a name: 30 minutes. => REMEMBER, WE ARE JUST MEASURING OUR CHANCES TO SUCCESS. NO NEED TO SPEND MORE TIME, MONEY AND EFFORT FOR NOW! We do this by attaching the most difficult parts of a startup FIRST. Building a product is easy. Designing a logo is easy. Marketing it and getting paid for something really not, so do that first. You know you can manage the easy and fun part later on! Then, we did send out this coming soon page to about 200 architects by email asking their feedback, we did set up some Adwords and we left some comments on some blogs, forums or LinkedIn groups for architects with a back link. Within reasonable amount of time (24 hours) and with little effort, we had 10 sign ups already. And counting! 10 sign ups on a coming soon page sounds like worth nothing compared to Facebook, Twitter, Instagram and the next hype. But actually it is worth A LOT. It means so much. Given the little time and effort spent, 10 sign ups is huuuuuuge. If with little effort and no product in hand we can get 10 sign ups, then just imagine how much sign ups we could get with decent marketing effort and a well developed product. We continued our marketing efforts for a little more, to get some more evidence of success. Once we did hit 100 sign ups, we decided to start building a first prototype. Today, we have over 1,000 architects signed up to our beta page. Hey…one more thing….if you like this blog and you want to say thanks in return, just tweet or like or share this blogpost. Or follow me on http://twitter.com/pietereer for more updates or for occasional nonsense like a picture of my dinner via Instagram. 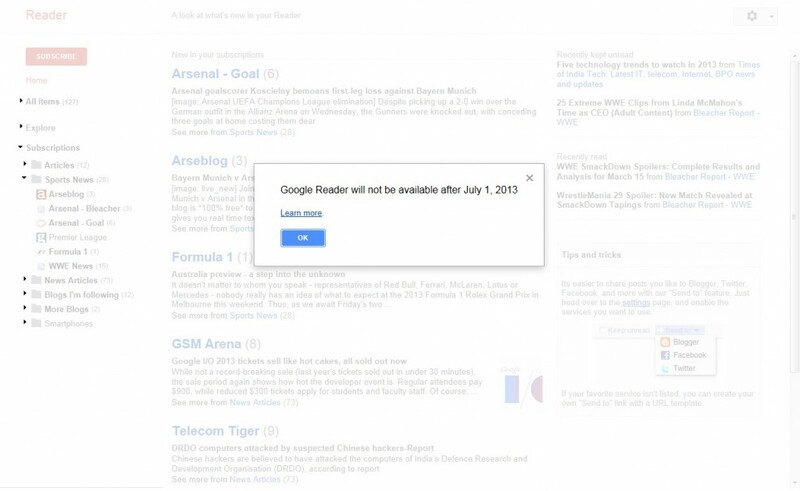 Google Reader users, time is ticking. 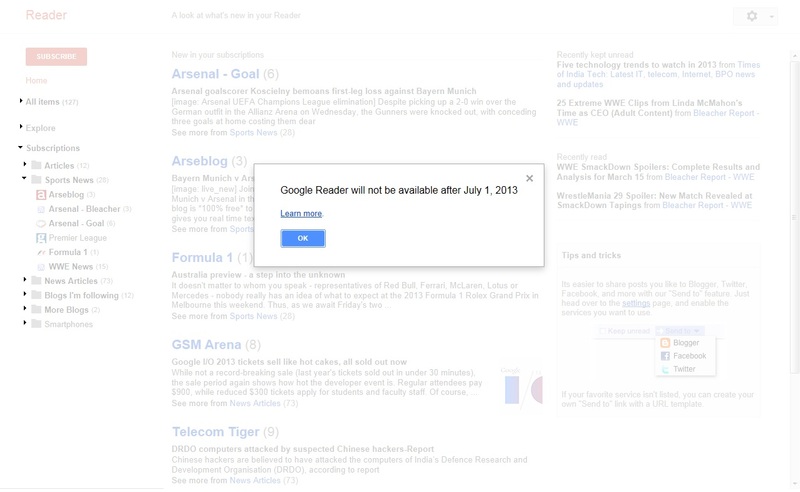 The first of July, Google Reader will discontinue. I have been looking around for a decent alternative. Decent for me means: a normal reader. Not a “fancy” thing that tries to take decisions on your behalf on what posts are important, which picture to show as a cover, how to display and organise information or tries to be smarter than an airplane cockpit. Feedly and many others try to do this, but they are confusing me more then anything else. I will decide myself which information is important. The Old Reader (http://theoldreader.com/) did it right for me. Simple, clean, minimal. Not too fancy, not too smart. I think it’s the closest to the real Google Reader. And it allows to import your Google Reader account so you can continue reading without interruption.